Dog work is like horse work. The more you learn, the more you realize there is so much to learn. 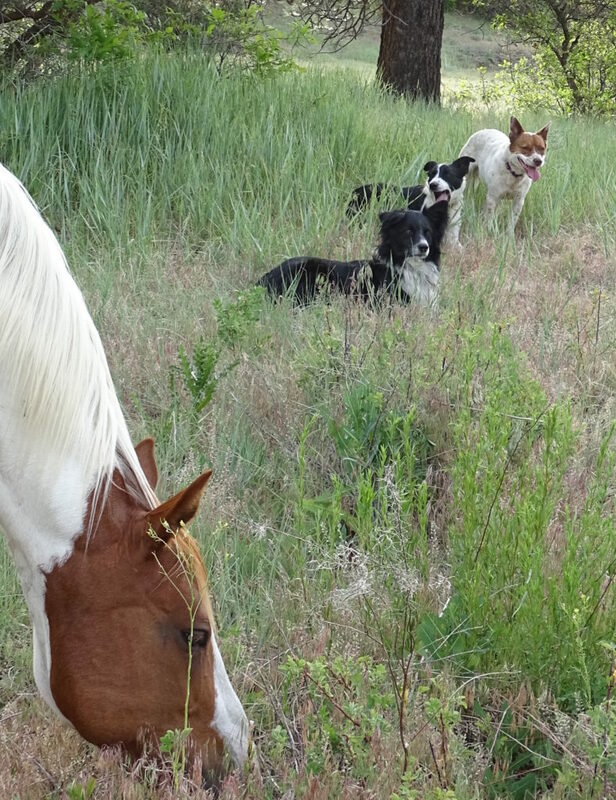 Dogs, horses, and humans all benefit from Dwell Time. Read more here. Over the past few months, I’ve been working with an accomplished herding dog trainer, Ann Chernoff Allan. She’s had great success with her Australian Shepherds in trials and shows around the country. She also uses her dogs daily to move livestock around her Colorado acreage. I was thrilled to meet her and happy that she agreed to volunteer some time to help me with my dogs, using her sheep. My dogs are Peeko, Monty, and Kip. Peeko is a healer mix with a crippled front leg. Despite her permanent injury, she’s quick, agile and has done a great job helping me move cows. Ann felt, however, that her injury would be too aggravated by working with sheep. She’d have to sit out these sessions. Monty is a young border collie mix. 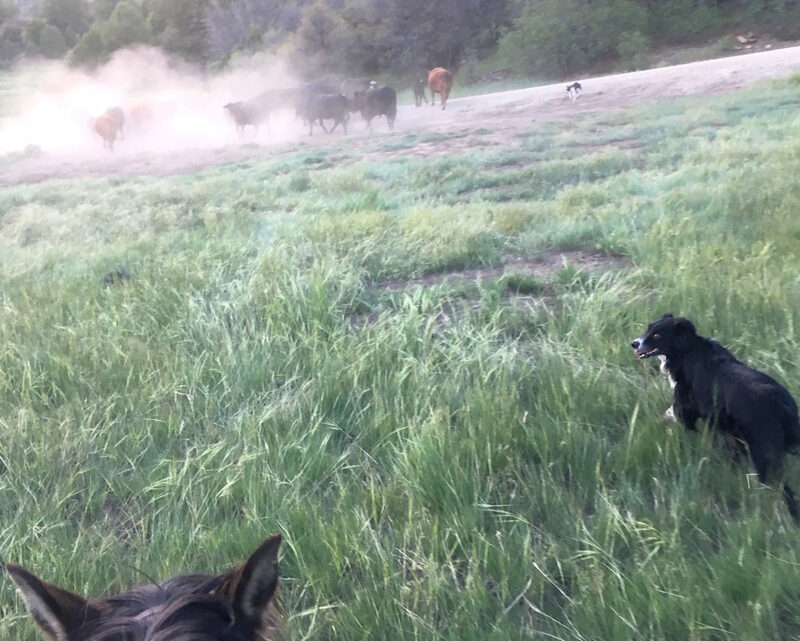 He’s lightning fast (much faster than speedy Kip and Peeko) and seems to have a keen sense of typical border collie strategies when moving stock: he likes to monitor the perimeter and push cows back to the group. Unlike Peeko, he does not like to heel or push the cattle from the rear. Kip is an Australian Shepherd acquired as a puppy in Iowa. I was told she was 100 percent Aussie. When I sized up Ann’s dogs (all purebred Australian Shepherds), I had my doubts. So did Ann. Her dogs are bigger and stockier. Kip was no purebred. According to the test, completed by swabbing the inside of her mouth with special brushes, then sending them off to Mars laboratories, Kip was three-quarters Aussie. The remaining quarter of her lineage had lines from terrier, herding, guard, and sporting breeds. Read more about the Wisdom Panel tests here. Read Monty’s Wisdom Panel results here. Read Peeko’s Wisdom Panel results here. There was one more helpful result in Kip’s findings: like her buddies, Kip tested negative for the Multidrug Sensitivity gene mutation. The genetic variant, which can cause dogs to fall into comas or die when given certain drugs, is especially common among Aussies. Phew. Now to get to work! 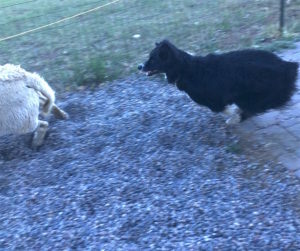 My dogs are enthusiastic herders. They have all-day energy and love to move cows, people, and each other. So it was a shock when they cowered at the sheep. “No way. Take me home,” they seemed to say as they scuttled between my legs. These were new creatures. These creatures were making eye contact and emitting new sounds. Like many horsemen and women I admire, Ann values dwell time and giving animals opportunities to think for themselves. She knows that in the moment and after the moment, the dogs are thinking. “Give them time. They will be different next week. You’ll see,” she said. We returned the following week. “Oh, yeah, I got this,” the dogs now seemed to say. In an undisciplined, rookie fashion, they now approached the sheep with vigor. Ann’s job would be to help me and my dogs learn how to nurture instinct, retain spirit, and craft sound brains and bodies into something disciplined and effective. All without the least bit of micromanaging. The dogs would learn quickly. My challenge was to keep up with them. 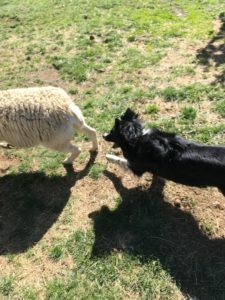 Ann taught me, for instance, that rewarding my herding dogs by letting them reconnect with sheep was far better than any treat. That’s good to know. I’m not much of a treat advocate, anyway. Check out this slideshow on toxic and dangerous foods for dogs. Stay tuned for ongoing reports. 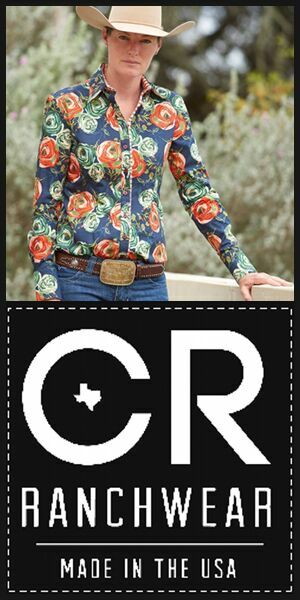 Posted in Dogs and Horses and tagged herding dogs, training dogs and horses. Just wondering what exactly you mean by “reconnect with sheep” please? Hi Becky, Thanks for your question. In my novice mind, reconnecting means being able to herd them. When dogs are pulled off stock, especially in the middle of what in their minds is a task to be completed, it’s like a punishment.